Click here to read my review of Harry Potter and the Deathly Hallows: Part 1. An unprecedented film saga comes to a solid close with Part 2 of Harry Potter and the Deathly Hallows. The decision to split the final installment into two films ultimately paid off (apart from the literal payoff, which was inevitable), as it gave room for the story to breathe in the midst of intense action. I complained after seeing the first installment that it felt like only half of a movie, providing no real closure. Similarly, Part 2 has no setup, but when viewed together, the two parts make for a splendid, emotionally balanced finale. As a fan of the final book, I have a few minor qualms, but overall, the Harry Potter film franchise goes out on one of its highest notes. 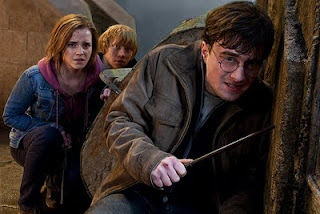 Harry Potter (Daniel Radcliffe) continues the search for Horcruxes (objects containing pieces of Lord Voldemort’s soul), along with his best friends, Ron (Rupert Grint) and Hermione (Emma Watson). The search takes him back to Hogwarts School, where Severus Snape (Alan Rickman) serves as Headmaster, and Death Eaters freely roam the grounds. 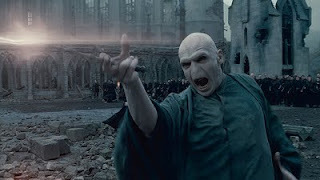 With the help of his friends and professors, Harry makes a last stand against Lord Voldemort (Ralph Fiennes) and his followers. That’s a barebones summary, and it’s worth mentioning that if you’re not caught up at this point, prepare to be lost. Actually, if you’re not caught up at this point, why even consider starting with Part 2 of Harry Potter 7? It feels good to return to Hogwarts, as its familiar locations have featured in every chapter except for Deathly Hallows: Part 1. The visuals of the school falling under attack are huge in scope and very rewarding. This is the end, and director David Yates and his filmmaking team hold nothing back. The principal cast members likewise give their all, with many saving their best performances for last. As I have said before, immaculate casting has been the driving force behind the success of the Harry Potter films. Screenwriter Steve Kloves has done well in adapting them, and multiple directors have added their own unique visions, but all would have been for naught if the wrong actors had been cast. In addition to Radcliffe, Grint and Watson, all of whom deliver nuanced, mature performances, Alan Rickman stands out yet again as Severus Snape. Ten years ago on opening night of the first Harry Potter film, I gasped as soon as Rickman burst into view, because I knew at once what a perfect choice he was. Snape’s backstory was one of my favorite parts of the final Harry Potter novel, and the film handles it superbly, with Rickman spanning a wide emotional range during his relatively brief time onscreen. In the few days since seeing the film, Snape’s scenes stand out in my mind above everything else. Everything in HP 7: Part 2 works, but as a fan of the book, I simply must take issue with a few alterations made toward the story’s end. I’ll not go into detail, as I wish to keep this spoiler-free, but the final showdown between Harry and Voldemort is about ten times more epic on paper than on screen. Why is that? All the film had to do to knock the finale out of the park was follow the scenes laid out in Rowling’s novel. On the whole, Deathly Hallows stayed very true to its book, so I have no clue why Kloves adapted the ending the way he did. The film ultimately cheats itself out of what should have been an unforgettable, highly emotional showdown. Instead, the battle goes out with more of a whimper than a bang. The magic returns with the epilogue, though, which stays very true to the book’s last pages and delivers charm and emotion in spades. Harry Potter and the Deathly Hallows is a finely-crafted powerhouse and arguably the series’ best film, though I still cast my vote for Harry Potter and the Sorcerer’s Stone. Granted, I’m a sucker for origin stories, but that first movie is still the most magical to me, and I think it comes the closest to recreating the feel of its book. I’m reminded when I watch it of how much the filmmakers got right the first time around. The casting, the script, the visuals, and John Williams’ majestic score set the tone for everything that came after. Looking back on the Harry Potter film series, there’s really nothing to compare it to. A seven-film (technically eight) retelling of a beloved book series; when else has any team of actors and filmmakers stuck with a decade’s worth of movies? It’s a monumental achievement made truly special by the series’ sheer quality on all fronts. The success of the Harry Potter books marks an unsurpassed literary phenomenon, and it’s worth remembering that the film versions played their part in the books’ success. They did what all great book-to-screen adaptations do: point people back toward the remarkable literature that started it all. HP 7: Part 2 features mostly the kind of action we’ve seen before in the Potter films: intense but not graphic. There is one scene where a snake repeatedly bites someone, and though the attack happens offscreen, it’s still intense. The overall level of “intense action violence and frightening images” is in line with Harry Potters 2-7.